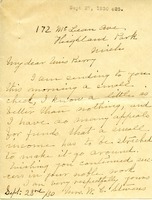 Letter to Miss Berry from Mrs. W. C. Stevens. Mrs. W. C. Stevens sends a small check and hopes a little is better than nothing. She wishes Miss Berry continued success.